It’s now common knowledge that floods are the single most frequent natural disaster in the United States, with flood restoration costs amounting to a billion dollars annually. When we narrow it down to California, we can’t fail to mention last year’s El Niño alert, which caused a wide wave of panic across the state, with insurance companies urging homeowners to purchase flood insurance before it was too late. Although weather forecasts for the winter of 2016 suggest the possibility of a different threat – La Niña, typically associated with extremely dry winters – the West Coast of North America has known wet winters during La Niña, as well. The bottom line is this – if you live in San Diego, California, and you still haven’t purchased flood insurance, it’s high time you did. Is Flood Insurance Federally Required? Despite the dangers and the high amount of average flood insurance claims, you are not obligated to purchase flood insurance, either by the State of California or by the federal government. Nevertheless, homeowners are oftentimes mistaken to think that just because something isn’t obligatory, it’s not necessary. Many fail to realize that even if you live in a ‘’low-risk’’ area, you can still be affected by floods. If you are not sure what risk zone you live in, you can consult the San Diego County’s Office of Emergency Services and inquire about the potential tsunami flood areas. Also, check out the tsunami flood maps prepared by state disaster experts. Lastly, follow the news releases and alerts published by Federal Emergency Management Agency (FEMA), specifically related to California. 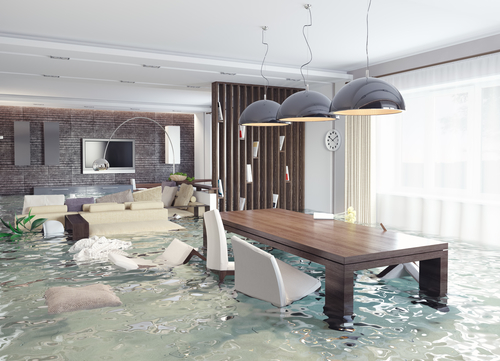 As we recently wrote on types of water damage not covered by the Homeowner’s Insurance, flood damage and consequent flood damage restoration are NOT covered by this standard insurance policy. Since floods typically occur as a result of natural disasters, such as storms, or river, lake or ocean overflow, the cause is technically located outside the property covered by the insurance. Therefore, most property insurance policies, including the Homeowner’s Insurance, don’t cover flood-related losses. How to Get Flood Insurance in San Diego? Luckily, protecting your property against flood damage in San Diego is quite easy. Flood insurance can be bought from the federal government through FEMA’s National Flood Insurance Program (NFIP).With this insurance coverage, the maximum premium you would have to pay per year is $600-$700. NFIP is in charge of determining the coverage and the premiums. The County of San Diego is a community participating in NFIP, so this flood coverage is available to San Diego homeowners. Building Coverage – Typically, this type of coverage can insure your home’s structural elements to the amount of $250,000. In essence, it insures the physical structure of your home. Contents Coverage – Basically, it covers the valuables inside your home up to $100,000 in value. Consult your trusted insurance provider about whether the type of flood coverage you choose includes the contents coverage in the first place, as well as whether it insures property such as furniture, microwave, dishwasher, etc. Replacement Cost Coverage – This type of coverage comes with a couple of restrictions: it can only be applicable to single-family homes that are insured to 80% of the amount necessary for the actual home replacement. Also, the replacement cost coverage covers the whole home and not the contents. Even though flood insurance is generally inexpensive, it’s worth noting that homes located in low to moderate flood risk areas can purchase low-cost policies – an even more affordable option. After you have purchased your flood insurance, you’re one step away from being sure you can successfully deal with any flood-related damage. KIC Restoration is the premier provider of flood damage restoration San Diego services. We also provide 24/7 flood cleanup, drying and restoration. We use top-notch Goldmorr technology to curb the damage swiftly and thoroughly. We also serve as a medium between you and the insurance companies, making sure you get a fair and transparent service. Call us at Toll-Free: 866-265-5245 or contact us online.